A home or workplace can be full of clutter. These can be various things such as clothes, books, electronics, appliances, tools, toys, files, goods that have been replaced and so on. All of these items will reduce the amount of free space in your home, make the place less comfortable, prevent you from buying new goods and add more work to a house clean or move. A house clearance can be the way to handle this, as you sort through all of your goods and get rid of the unwanted ones. You will go through each item and determine its use. Bag and take part goods, then carry then from your home. 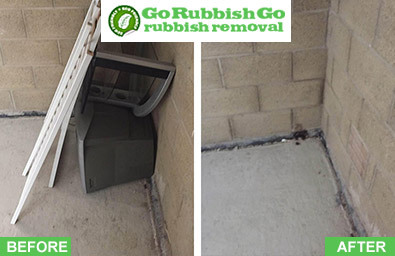 All that rubbish cannot be disposed of using your usual rubbish pick up so you need to look for alternatives. This can require a lot of work and research, as you find suitable sites to get rid of things. This shouldn’t be an issue though because Go Rubbish Go can help with every W1 rubbish removal task you face. Call 020 8610 9182 today to find out more! Our expert staff can be hired to help with commercial clearance, flat clearance, builders waste removal, Marylebone waste collection and more. Whatever rubbish you have and wherever you have it, we can take it away from you. Our staff will come to your address in W1 and help with each part of the process. They will even come to NW1 with all the necessary equipment and do the tough work so you don’t have to. Our rubbish clearance W1 professionals can be at your address in no time. They will bring all the equipment they need and be in suitable vehicles. They will work hard, fast, yet carefully, to sort, bag, move and transport your unwanted goods away. They will endeavor to prevent injuries and accidents, and always work with you. Our waste clearance Marylebone vehicles make it easy for us to shift items form your property and take it to the correct waste disposal sites in NW1. Our firm follows all guidelines and rules to ensure that goods are disposed of correctly, safely and legally. Very prompt, very professional, everything one could wish for in a waste disposal company! My home in Marylebone, W1 looked so much better after their visit, completely free from junk and clutter. Thanks a lot! Get rid of Waste in Marylebone. Contact Our W1 Rubbish Removal Experts! Our junk removal team can be hired to help as you require. We can send as many staff as you need at a time convenient for you. Tell us what you want and we will get the necessary info to give you the perfect deal. With all the details sorted, we can give you a free quote. We will charge you only for the support we provide, so there are no unnecessary costs. You get an affordable deal and because our quotes are no commitment, there is no worry. 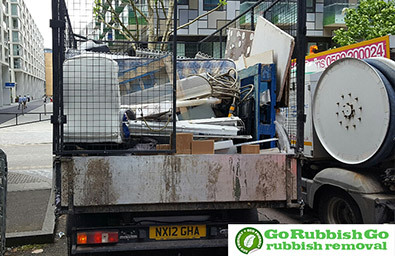 Go Rubbish Go can help with all waste disposal in Marylebone, so call now on 020 8610 9182 to find out more. 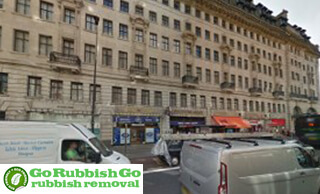 At Go Rubbish Go, we are the only company that you need to call upon to help you with waste removal in Marylebone, W1. As an expert and well reputed company in this business, we have tended to many properties over the years and have helped their owners with every Marylebone, W1 rubbish disposal job imaginable. Thus, you can count on us to get your home into a state that is no longer the cause of embarrassment. In order to prevent it from becoming an eyesore, or to rectify an already unsightly property, get the situation sorted and call us today on 020 8610 9182. We will offer you an affordable and efficient solution! Marylebone is in the Borough of the City of Westminster in Central London. It is near Paddington, St. John’s Wood, Mayfair and Fiztrovia. It was once village and among the oldest places in the capital. Tyburn Manor, the local estate, was listed in the Domesday Book. It uses the NW1 and W1 postcodes, with other local postcodes being NW5, NW8, W1, W2 and SW1. Marylebone is known for being the home of various medical and dental practices, most of which are in Harley Street. Many attractive buildings are within the town, with notable examples being the mansion in Manchester Square and the Austro-Hungarian embassy. The mansion has appealing gardens and parts of the Wallace Collection. The area has strong transport links.